Since the 1950s, our country's greatest libraries have, as a matter of common practice, dismantled their collections of original bound newspapers and so-called brittle books, replacing them with microfilmed copies. 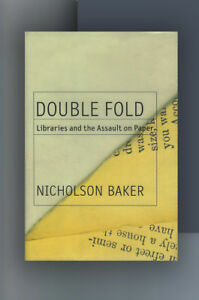 The marketing of the brittle-paper crisis and the real motives behind it are the subject of this passionately argued book, in which Nicholson Barker pleads the case for saving our recorded heritage in its original form while telling the story of how and why our greatest research libraries betrayed the public trust by auctioning off or pulping irreplaceable collections. The players include the Library of Congress, the CIA, NASA, microfilm lobbyists, newspaper dealers, and a colorful array of librarians and digital futurists, as well as Baker himself who eventually discovers that the only way to save one important newspaper is to buy it.Double Foldis an intense, brilliantly worded narrative that is sure to provoke discussion and controversy. I found it a *very* illuminating read and it made some really excellent points about how useful it is to carry projects without a clear sense of goal and direction. I thought his concerns about the privatization of historical archive are very valid. I couldn't help but share his concerns about destruction in order to preserve. Moreover, the book is remarkably readable and occasionally very entertaining (the virgin mummy section, for example).